The Earls of Coventry, Croome Court. 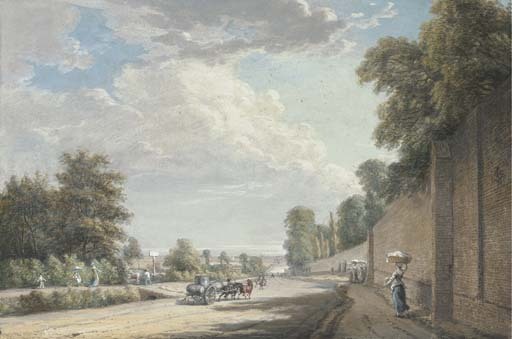 The presence of what appears to be some kind of barrier across the road in the distance, together with a hut on the right-hand side just beyond the prominent tree, suggests that this shows the Bayswater Road, Paddington leading towards the old toll gate, the subject of a number of views by the artist taken from the opposite direction. The subject would have made a more suitable pair to the view of the public house near Bayswater (lot 4) than the other possibility, the very long wall along Datchet Lane, Windsor (for which see J. Roberts, Views of Windsor: Watercolours by Thomas and Paul Sandby from the Collection of Her Majesty Queen Elizabeth II, London, 1995, pp. 72-5, nos. 19 and 20, illustrated in colour). For a drawing of Croome Court, where this watercolour hung in the collection, see lot 3. For a note on the purchase date of this watercolour see lot 4. We are grateful to Colin Hunter for confirming that this is a view of the Bayswater Road. The building in the distance at the bottom of the hill is The Old Swan. It has also been suggested that the figures on the left hand side may be the Sandby's nurse, Sally Loman with two of the Sandby's grandchildren, one of whom may be Thomas Minchin Sandby, born 1791 and therefore the drawing may date to the mid 1790s. Sandby executed another view of The Old Swan Inn at Bayswater, now in the Victoria and Albert Museum, London.